When an artist finishes an artwork, an episode is closed. While at the same time, the journey of the artwork only just begins. In this post, we want to take you on board of the journey the work ‘Habitat’ by Jakob de Jonge started to undertake. August 2016, In4Art got the opportunity to produce a Features for the province South Holland with the guideline: ‘reflect on the impact of new technologies on society’. We approached Jakob de Jonge, discussed the topic and our ideas to transform the session into ‘Revolution of Being’, and gave him the commission to realize a work. End of October 2016, the work ‘Habitat’ was born. 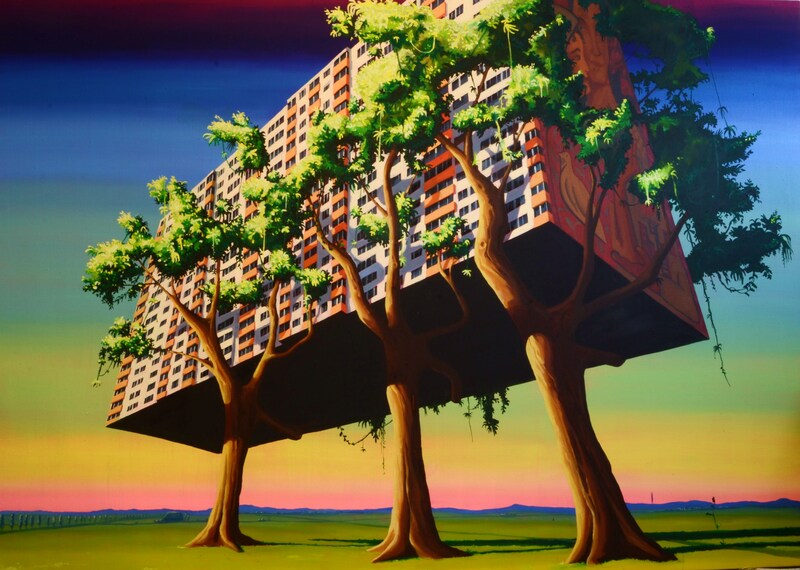 A large, powerful painted canvas 170 cm high and 120 cm wide, which captures the elements nature, technology and society. This made it the perfect ‘altarpiece’ for the talk show held during the ‘Festival van de Toekomst’ on November 10th that year. It got printed on postcards and a first In4Art article appeared. In December, the work appeared in the trailer of the features and was prominently showed during the In4Art Salon. The second time the work was shown for a wider audience. Also, it was published in the Salon booklet. During that Salon, journalist Gretha Pama saw the work and decided to feature it prominently in the article she wrote about the In4Art Salon concept. 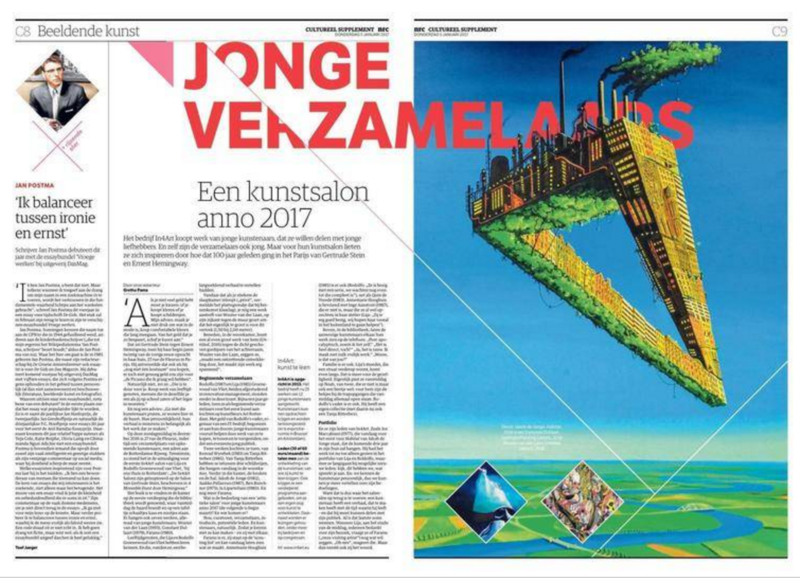 A two page article ‘Een kunstsalon anno 2017’ appeared in the national newspaper NRC, with a full page dedicated to ‘Habitat’. This triggered a lot of interest. Luckily, the work will appear during the In4Art pop-up exhibition at the head office of the Province South Holland: Provinciehuis (Zuid-Hollandplein 1, 2596 AW, Den Haag). There it will be on exhibit, together with other works from Jakob de Jonge – Enlightenment and Les Innocents. For a period of two months it is open to the public to visit in the Delta room or during the MINT symposium. 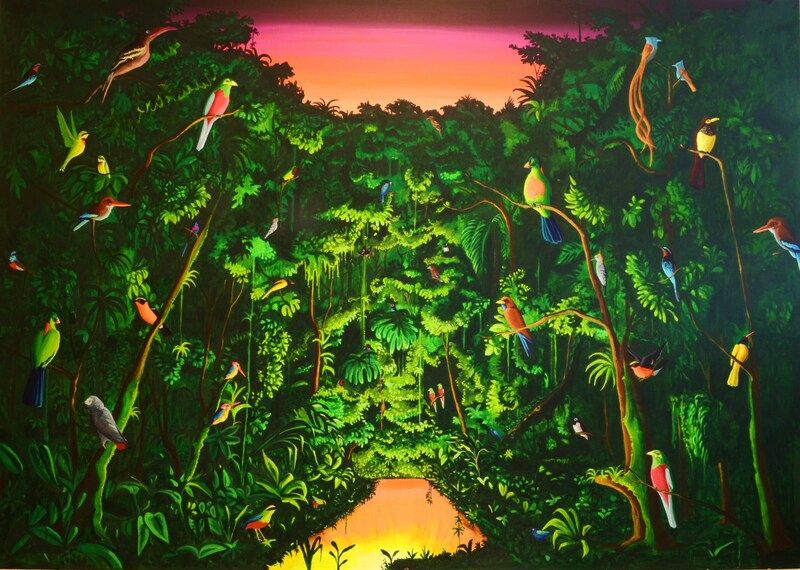 Again a period in which the painting will be shown to new audiences. From March on, for the time being, ‘Habitat’ will form part of a mini-collection that goes to one of our members….until a request from an art institute comes to include the work in a temporary exhibition. Then the member will be invited for the opening and can proudly say: ‘that painting is currently part of my collection!’. And ‘Habitat’ will be prepared for its fifth spotlight location. *In4Art has in its mission to create visibility for the artists in the incubation track and actively put on display the works in the In4Art collection, so that a large audience can enjoy it. We do so by using various forms.